People have written at length about how to live debt-free or save for retirement, but few have written about the reason for doing these things. Why should you work to become debt-free? Why should you save for retirement? 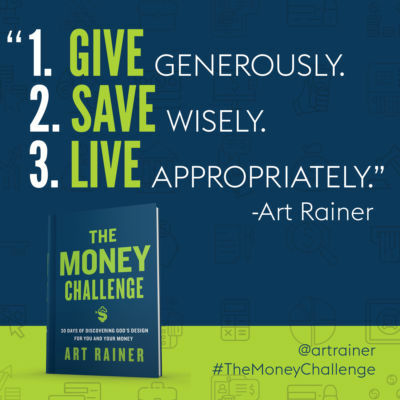 In The Money Challenge, Art Rainer gives clear, biblically-based, practical wisdom about why we should give generously, save wisely, and live appropriately. 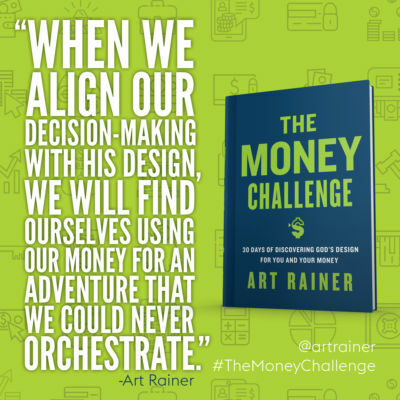 The 30 money challenges are opportunities for you to put into practice what you have learned. They are simple, yet valuable steps to help you become a better steward of God’s resources. I can’t wait for you to read Art’s book. It is so good. Art encourages and equips you in The Money Challenge. Not only will you learn a lot, but you will also enjoy his captivating writing style. Have you ever found yourself waking up from your financial dreams, recognizing your reality is quite different? 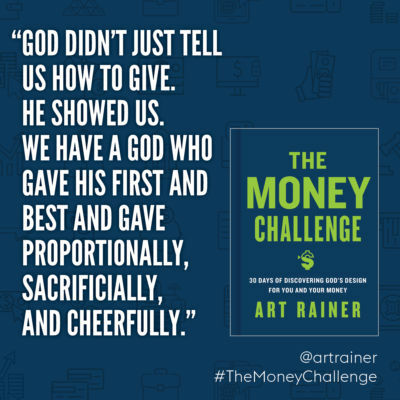 The Money Challenge creatively teaches and enables you to honor God through your life and finances. Thanks, Art, for tackling this tough topic. Pastors and church leaders: run to this book! I wish I had this book when I was a pastor. It is short, easy to read, and filled with practical steps to lead a congregation toward greater biblical stewardship. I would give a copy to every one in my church. Those who take these steps will have a church filled with joyous givers! 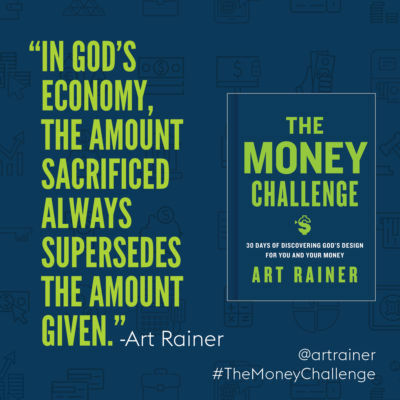 The Money Challenge is a hopeful, gospel-oriented primer on using finances for the sake of the kingdom. Everyone can benefit from the biblical wisdom here, regardless of financial or social background. 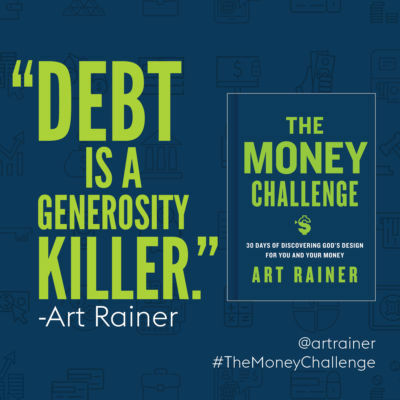 The Money Challenge by Art Rainer is an excellent book on how to be financially responsible. The 3-fold challenge to give generously, save wisely and live appropriately is mapped out in clear, practical and obtainable steps. God designed us to be generous and wise with our resources. This short and easy to read work will help you get there. I am delighted to commend it to you. Available for bulk purchase! 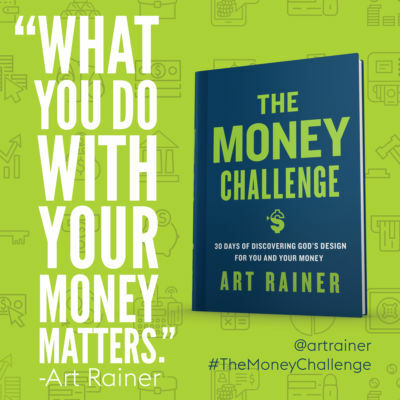 Receive 20 copies of The Money Challenge for only $5 a copy! For more information on bulk pricing, please visit LifeWay.com. Art Rainer is the Vice President for Institutional Advancement at Southeastern Baptist Theological Seminary. He holds a Doctor of Business Administration from Nova Southeastern University and an MBA from the University of Kentucky. Art lives in Wake Forest, North Carolina with his wife, Sarah, and their three children. "Generosity is the 'why' behind becoming financially healthy." 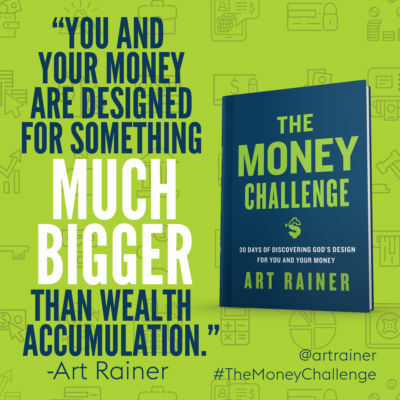 Enter your email below to receive a free chapter from The Money Challenge. Copyright © , B&H Publishing Group and Lifeway Christian Resources. All Rights Reserved. | An EMG site.